From the creative cauldron of Vilnius comes a very worthwhile trio filling up a two-LP set with some very involved and lively collective improvisations. 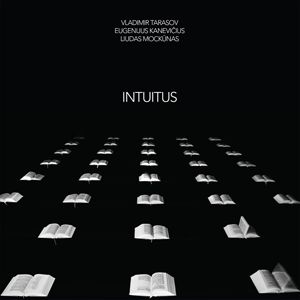 Intuitus (NoBusiness Records NBLP 92/93) features Vladimir Tarasov on drums, percussion, cimbalom and hunting horn, Eugenijus Kanevicius on acoustic bass and electronics, and Liudas Mockunas on soprano and tenor saxophones, clarinet and bass clarinet. The three know what they are about and what to expect from one another. The resulting improvisations reflect a knowing presence accordingly. This is music that is both local and international in its roots, freely jazz rooted but also channeling some of the deep local musical currents in subtle ways, in the use of the hammer-zither cimbalom, for example. Everybody is in the close-listening mode. Mockunas gives us plenty of expression and tone variation with his array of woodwinds (he gives us some especially wonderful soprano playing but sounds good on all four instruments), Kanevicius brings up the bottom with a punctuated, soulful attack and adds appropriate electronic colors from time to time, and Tarasov plays free-alive drums of note and intelligent use--giving the trio an advanced irregular horizontal momentum from the many sounds he realizes on a conventional set and the colorful textures he adds with his secondary instrumental soundings. This is uncompromising free music with a kind of Zen-like concentration on sound poetry spontaneities. There is a DIY feel to it all, partially perhaps as it was recorded in an intimate setting--in Tarasov's home studio. But most of all there is an ease and informal lucidity that comes out of three exploring possibilities together with a sympathetic togetherness and purposiveness. It has that kind of "we are home and relaxed" feel I used to get hearing Sam and his trio in the Studio Rivbea setting years ago, only of course the trio here has its own way to get it all moving. A good one--a very worthwhile example of these three getting to some outside zones. Check it out. Well done! Joelle Leandre 10, Can You Hear Me? Grego Talks About His Album "Expansion"